Sometimes I make something like a veggie stew or pasta sauce and realise that it could become a delicious soup with just a little extra water. That’s exactly how this Tomato, Butterbean and Spinach Pesto Soup came about. 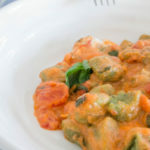 I had made it as a sauce for baking with gnocchi, similar to this recipe, and I thought it would make a great soup; something a bit different from a normal tomato soup. And I was right. 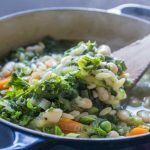 Full of flavour, colour and easy to make from a few ingredients you probably already have in the cupboards. Start by making the spinach pesto. Add the pine nuts to a blender, or pestle and mortar, and blend until finely chopped. Add the frozen spinach to a small frying pan and cook until defrosted and any excess water has evaporated. If you’re using fresh you’ll need to wilt it down and then chop it. In a small bowl mix together the pine nuts, spinach, garlic, Parmesan and salt and pepper. Put to one side. Add a little olive oil to a saucepan and add the onion, fry for 10 minutes until softened. Pour in the passata and vegetable stock, bring to the boil then reduce the heat and simmer for 15 minutes with the lid partially off. Stir in the butterbeans and continue to simmer for 10 more minutes. Serve the soup in bowls and dollop the pesto on top. 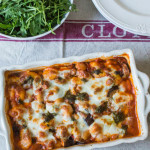 Serve with some warm, crusty olive studded bread if you like. The tomato soup is comforting and familiar with the added butterbeans giving a lovely bit of substance. A good vegetable stock is essential for good soup. I liked scooping up the pesto and soup with crusty bread; getting different proportions of soup to pesto each time. This tomato and butterbean soup freezes well, I stirred the remaining pesto through before freezing it and it’s been delicious for warming winter lunches. I seriously can eat the pesto spoonful and using it in soup is just brilliant! Soups are a great way to stay warm this week – it is so freezing and I can’t believe it continues snowing! Would love a hot bowl of soup right now, looks delicious! I like the way you think, this does sound like a fabulous and unusual soup! This is a great way to pimp tomato soup, a wonderful way to stay warm and beat the cold from this storm that is sweeping the country. I have a question. First, every time I make pesto from scratch I’m thrown off by the taste of pine nuts, I don’t like the flavor. However, anytime I buy pesto made with pine nuts I LOVE it! Has that ever happened to you? I wonder if it’s because I’m using an off-brand or something? This recipe looks amazing by the way. Worse case I can always buy my pesto and continue with the soup from there. I like the flavour of pine nuts so it’s no problem for me! You could use ready-made pesto and add some extra spinach. Isn’t the evolution of a recipe fun? This sounds wonderful, Caroline. Yum! This sounds so delicious. I’ve never thought of adding pesto to soup, brilliant! And the beans are another great addition! Caroline… This looks SO GOOD! Oh my gosh, I seriously want some now. I love tomato soup, and I love pesto, AND I love beans. This is literally all the things I love haha. I can’t wait to try this!